These fabulous and hearty soups will warm your family’s heart . . . all year round. Nothing beats the aroma of a simmering soup, and Good Housekeeping has 70+ triple-tested recipes that the whole family will enjoy. Offering a mouthwatering array of choices and flavors, the soups include everything from classics like Chicken Noodle, Split Pea with Ham, and Vegetable Chowder to Vichyssoise, a refreshing summer Gazpacho, Lobster Bisque, and Pasta e Fagioli with Sausage. In addition to the delicious recipes, you’ll get expert advice on how to plan ahead as well as tips and tricks for making the perfect bowlful of goodness every time. Good Housekeeping (goodhousekeeping.com) is a leading lifestyle media brand inspiring a monthly audience of 30+ million readers to discover genius innovations, delicious ideas, style-savvy trends, compelling news, and best-in-class products for their homes, families, and themselves. The Good Housekeeping Institute’s state-of-the-art labs combined with Good Housekeeping’s seasoned editorial talent and renowned test kitchen is unparalleled. 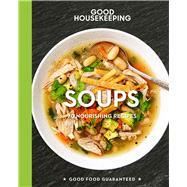 In addition to its US flagship, Good Housekeeping publishes five editions around the world.